Pillars are draped in faux bling, bound in cable ties to look like a bristle brush or covered in a knotted weave of those skinny, noodley balloons (called twisting balloons) used to make balloon animals. Tables have been inlaid with incomplete Scrabble tile sets purchased on eBay; street signs, bath tubs and even a classic “Walk/Don’t Walk” sign (which makes for a particularly warming seat) are now chairs. Bottom line: Thanks to the craftsmanship of some crazy, brilliant, out-there, what’s old is new again and hardly anything is what it seems. 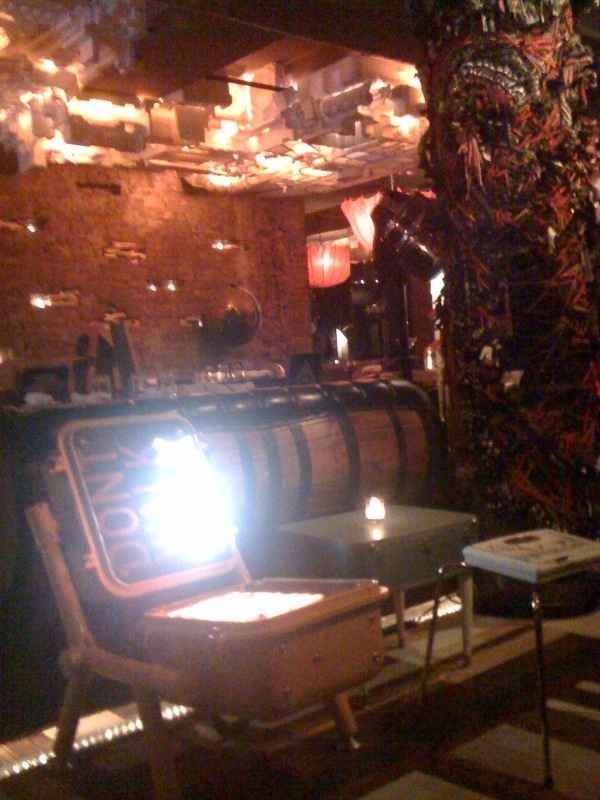 Everything in the restaurant is reclaimed or redone somehow, or used in an unexpected way. Even the truffled deviled eggs came out lined up in an overturned egg carton, and the chicken-n-waffles ($12) — a table favorite — came out in a hot cast-iron skillet, presumably the one that had something to do with how the dish was cooked. But then, everything else was presented on … white plates. Rectangular white plates, oblong white plates, white bowls, all uniform white, white, white. Really, so insignificant. But we just loved the decor so much we wanted it to go all the way, down to the level of detail where that aesthetic would still be there even when we finally pulled our eyes away to look down at our food. Oh yeah, the food! Lands solidly in the “grub” category. There are more ladylike dishes on the menu, but the best of what I sampled was the hands-on finger foods. So whether it’s Hong Kong ribs ($20) at 10 p.m., a late-night dessert of the (darling) housemade fudgesicles on a stick ($8), or a 4 a.m. order of disco fries ($12) to sop up the booze, just get messy. 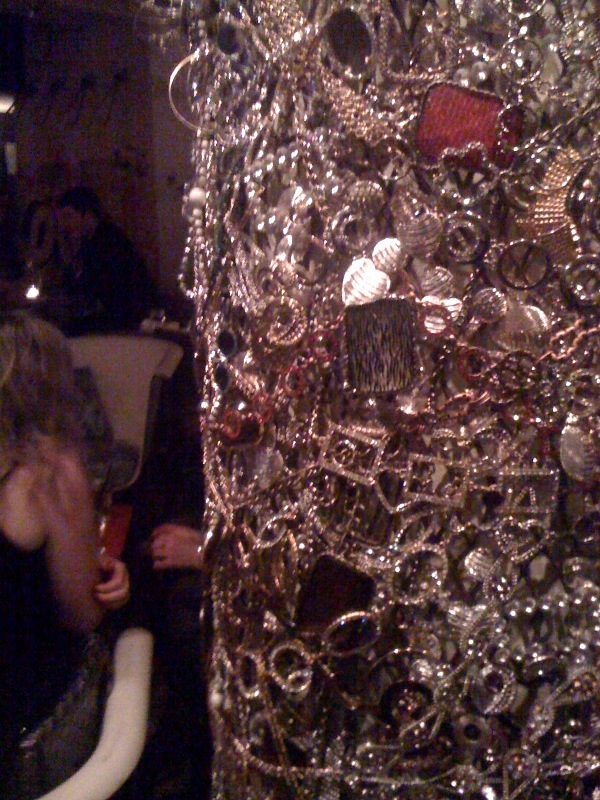 The Collective, 1 Little W. 12th St., at 9th Ave., 212-255-9717. More information can be found here. And the pie? Outta this world. And yet, I hate to say it, but as I scraped together the few last bites of now-tepid collard greens, I couldn’t push back that nagging question that’d been lurking near consciousness since my first bite: This is what all the hype was about? 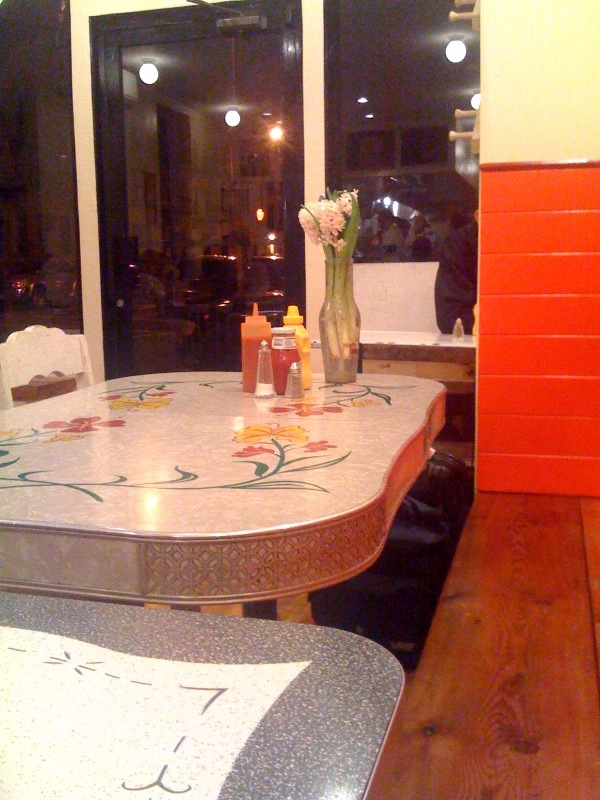 The briefest background for those not super-saturated with New York hot-button food topics: Chatter about the imminent reopening of this beloved neighborhood spot by this city’s fried chicken obsessed legions had reached near-deafening levels since the New Year. More than a little swept away by the crescendo of voices — writers, bloggers and Twitterers, you too — chanting for Pies ‘n’ Thighs return, I was prepared for it, (dare I say it?) … this could be the best fried chicken I’ve ever tasted in my life. And, of course with that expectation in mind — it wasn’t. Good? Yes. OMFG-mind-blowing-beyond-words? Not tonight. Unexpectedly — as I’m always a savory-first, sweets-second sort of girl — my favorite part of the meal was dessert. 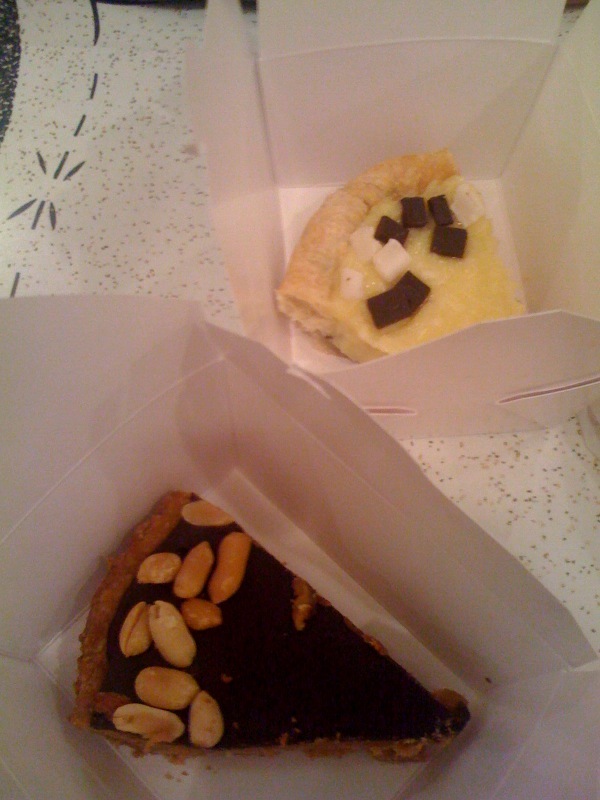 I shared a slice of peanut butter pie (bottom) and coconut cream pie with the chef, and both of them were just sublime. The peanut butter pie reminded me of nothing so much as one giant Reese’s filling, only better, and as dense but creamier. It’s the sort of slice that’s best enjoyed by one forkful at a time — savor the bite, let the flavors melt into your mouth, set down the plate and go back for another bite a few (or 15) minutes down the way. It’s the perfect slice of pie for watching a movie. And the coconut creme pie was pillowy and tropical, a luxurious pudding that was best eaten in-hand (so as to keep the filling from sliding off the crust). A thin chocolate layer added to the decadence. I’ll be chasing after the memory of slices like these when I order pie again in the near future. So will I be back? Most definitely, for more things that come with biscuits, more pie, to explore more of the menu, and yes, probably one day for more of the protein portion of the restaurant’s namesake — although it’s telling that the fried chicken is at the last in line. Maybe by that time the hype will have subsided and the chicken and I, we can have a proper introduction. No wonder chefs, restaurateurs and almost anyone involved with the business of food have a love/hate relationship (more like, hate/lukewarm like/hate some more) with the food blogsphere — although, for what it’s worth, that chatter showed me the door. 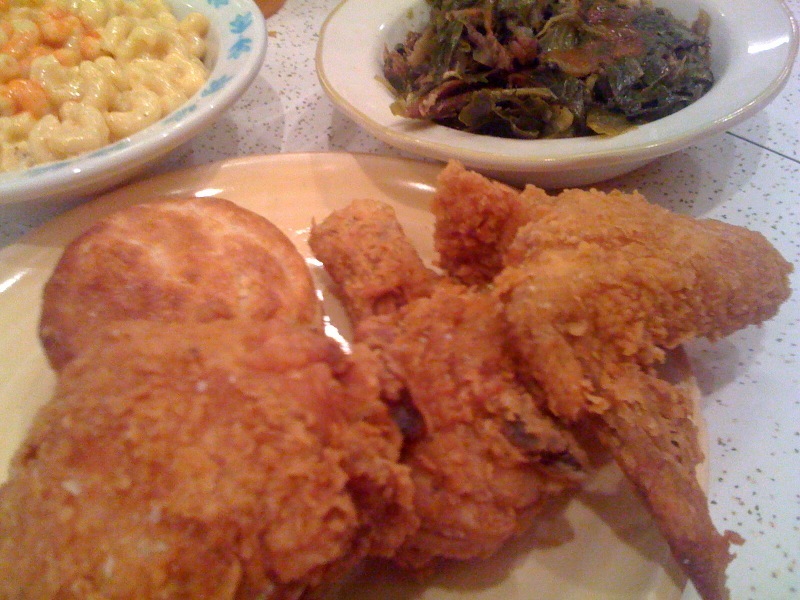 Pies ‘n’ Thighs, 116 S. 4th St., at Driggs St., 347-529-6090. Open daily. I eat enough burgers to know that the big boys are 8 oz. and up, the average burgers 6-8 oz. and fast-food style burgers, i.e. Shake Shack (which I adore) and 5 Guys (which I hate), are a slim 3-4 oz. These are just the rules of the burger kingdom. So when I spotted a 12 oz. burger on the menu at La Palette, both when I was browsing their online menu and also later on the menu in the restaurant, I’m pretty sure my eyes bugged out in that cartoon-y way, just a little bit. TWELVE OUNCES?! This thing has got to be just gargantuan. And cheap, at $13 for a burger (add $1 for a fried egg) plus fries and salad. This sounds like an impossibly good deal; I had to try it. Sometimes, impossibly good deals do exist. Not sure I could do this alone, I convinced my friend to split the “Tudo” burger me: 12 oz. of top sirloin beef, melted mozzarella, mayo, boston lettuce, tomato and a fried egg. Then, realism sets in. “Nah, that’s just the egg,” my friend says, referring to the lumpy shape on the top half of the bun that, in the darkness, I’d been *hoping* was melted cheese obscuring a second patty — not because a burger needs that much beef, but on principle. But she was right. It was just the egg. A block later we came upon a mostly empty Magnolia Bakery. “Eff it, let’s get a cupcake to split, too,” I said. Spontaneity is the key to my Magnolia Bakery strategy: If you happen to walk by and it happens to not have a hoard of tourists queuing up down the street, go. Because they do make really great cupcakes: Light and cakey with a tall head of frosting, neither top nor bottom too sweet, Magnolia’s cupcakes are all about classicism: cake flavors are typically vanilla, chocolate or red velvet; the frosting either white or brown or lightly tinted in pretty pastel shades, with plenty of peaks and curves in which to catch traditional toppings, like sprinkles or chopped walnuts. Half a cupcake (two big bites) was the perfect pairing to half a burger (about five bites); I’d even choose to do it again, on purpose. The burger was well-seasoned, well-executed, and generally a success — aside from the false advertising. It would behoove La Palette to fix their menu; it’s not like they’d have to lower the price.